I would be surprised if most on the Internet or who were involved in training and nutrition weren’t familiar with the name Tom Venuto. I’ve known Tom (via email correspondence anyhow) for over a decade and he’s always been one of the good guys in the field. I may not always agree with him, but I’ll always listen to what he has to say. For those who have been living under a rock and have managed to avoid hearing about him, Tom is not only a successful natural bodybuilder, he is the author of perhaps one of the best books ever written about fat loss which is Burn the Fat, Feed the Muscle. In a field where most of the information ranges from bad to downright awful, Burn the Fat, Feed the Muscle stands out as being filled with excellent information on the how-to’s of shedding fat. From diet to training to everything in-between, it’s all covered and all quality information (even if a few bits of the information are a bit out of date/incorrect; such as the old saw that eating many small meals stokes the metabolism). Tom is also the author of a book that I’ve been meaning to review for months called The Body Fat Solution which deals more with behavioral issues related to losing fat and keeping it off. Also, a highly recommended read. But today I want to talk about Tom’s new product/project which he’s given the (somewhat gag inducing) title of The Holy Grail Body Transformation Program. 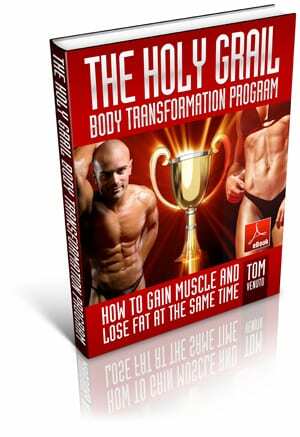 By ‘holy grail’, as you can see in the subtitle on the cover graphic above, Tom is referring to that commonly desired goal of gaining muscle and losing fat at the same time. This is a goal that many seek and few attain; usually trying to do both things at once tends to lead most people to spin their wheels. But as much as anything, this has to do with how they approach the goal. There are also some issues involved with expectations about what is realistic. I’ve discussed this issue in some detail in Adding Muscle While Losing Fat – Q&A and won’t rehash that here. On to the review. Beginning first with science and theory, Tom looks at some of the basic issues surrounding the topic of gaining muscle while losing fat and why, in a fundamental sort of way, the two goals are antithetical (Tom also examines exceptions, pretty much the same ones I’ve talked about before). Anyone who has read my own Ultimate Diet 2.0 or the articles Calorie Partitioning Part 1 and Calorie Partitioning Part 2 here on the site will be familiar with this information. Tom doesn’t spend endless time on this information but covers it thoroughly enough to be clear. The meat of the book is of course the diet approach and if you’ve already guessed that it’s a cyclical dieting program, you guessed right. Because fundamentally, outside of the exceptions such as overweight beginners or folks returning from a layoff (or drugs), alternating caloric deficits and surpluses is really the only meaningful way to achieve the goal of simultaneous fat loss and muscle gain since they require distinct nutritional, hormonal and physiological states. Tom looks at the issue from a rather large scale (e.g. yearly alternation of longer term bulking and dieting phases) to weekly to daily variations in caloric intake; I imagine that well-read, err, readers of my site will be familiar with many of the concepts he’s talking about. Tom does a thorough job of examining a variety of different strategies (both in terms of the number of dieting days and number of feeding days) ranging from 3:2-3 (3 days dieting, 2-3 days overfeeding) to 3:1 to floating carb days. As well, daily variation in carb/caloric intake is examined based on the time training is performed. Essentially what Tom has done is to gather a variety of different strategies (depending on the specifics of the goal) that have been used and looked at them all at once. I’d note that primarily carbohydrate intake is being modified here so, in essence, the caloric cycling ideas are really carb cycling ideas. I would note one thing here: the topic of intermittent fasting (IF’ing) is NOT discussed. I guess we’ll have to keep waiting for Martin Berkhan’s long-awaited book to see this treated in the way it deserved to be. Neither is the concept of Every Other Day (EOD) refeeds that gets talked about on the support forum from time to time. Next Tom moves to the discussion of training with, as you might imagine, most of the focus on resistance training (since this is the key to a lot of good things that are desired when the goal is body recomposition). He doesn’t go into a tremendous number of details here and there are no sample workouts in the main part of the book. I’d note that one of the appendices does have a sample workout under the name of The New Bodybuilding, basically a 3-4 day/week combination of heavy strength and hypertrophy work; the focus is primarily on more or less general guidelines for proper resistance training. Tom also addresses the issue of metabolic work and gives different guidelines (primarily for lower intensity cardio) in terms of frequency and duration depending on the specific goal. Which brings me to my biggest criticism of Tom’s book: there is little attention given to how to ideally integrate the training ideas with the dietary strategies that are outlined (outside of one short comment in the diet section on floating carb days and placing them around important workouts). Simply, achieving the ‘holy grail’ goal works better when training and diet are integrated properly. The book rounds itself out with a brief section on lifestyle factors and several appendices that include meal plans, a primer on determining energy requirements and a food database. I should mention that there is a throwaway ‘bonus’ on the topic of within-day energy balance; essentially an interview with sports nutritionist Dr. Dan Bernadot espousing the idea that large scale swings in caloric intake during the day have negative impacts on body composition. I say throwaway because it doesn’t say much; as well I think the ideas presented have been amply disproven by the success of people following IF’ing type approaches where very large scale swings in caloric intake are having, if anything, positive benefits when integrated properly with training. Summing Up: Is The Holy Grail Body Transformation Program great? I’d have to say no. It certainly doesn’t live up to the standard set by Burn the Fat, Feed the Muscle and the lack of integration of the training and diet may leave some people confused about how best to approach their goal. But it does provide a reasonably comprehensive examination of how to cycle calories and carbs to try to achieve the ultimate goal of body recomposition. Until Martin finally finishes his IF’ing book, Tom’s new book certainly provides a decent look at the topic. Finally, at $29, the price is certainly reasonable (as such things go).